I asked people in sultan ka koh and g10, all of them told me it would cost me 5000 MINIMUM as the whole dashboard had to be opened. Abu Bakr is PRO in his field. He now uses Linde R134A refrigerant. Very reasonable and honest man. Abu Bakar is very skillful an honest person. I visited his shop this season. His rates and his honesty is appealing. aoa gys my car civic 95 with stock d15b3 is giving me problem on ac after i washed its engine... when i switch on ac the car becomes v heavy and a sort of start missing even at hi rpm..had shown to mechanic who had adjusted its rpm from the carb back side black screw but still the problem rosed .. can any one share some expert opinion related to this ac business..
Mr Abu Bakar at G 8.give him my reference. He is honest and expert person. i tried his services and he is very much economical and experienced of his work. he did a good job. his charges are (2200Rs for GAS (linde Germany), 600Rs Servicing + labour, total 2800Rs). any other major part will be charged separately. i finished up in 3400Rs as a pipe was expired. I recently got my compressor changed from Mohal car ac i-10/3. The guy is brother of Abu-bakar. Rates are very reasonable and he is a nice humble man too just like Abu bakar. It took half a day as initial plan was to change bearing of previous compressor but we found out that gaatta (he called it) has play and the compressor is trash so had to go for kabli one. Evergreen Autos Is Located in heart of Islamabad. We are a registered company with NTN and GST Numbers. We established in 2012 and continued with expansion and diversity in our work. We possibly deal in every car as long as parts are available in local market. Our work mainly depends upon big tenders from cooperate sectors. We deal individually with local customers upon their request. we deal with walk-in customers with services from mechanical work to denting and painting. Please spare sometime to visit us. I could have suggested any place that is best to fix car AC but not had my luck yet. On the other hand I can help you and many from getting clearly robbed of money and AC not been fixed with deception to its extreme at height of Ramzan i.e 27th. The guy lied and lied again and again about every little thing to every major. He has degraded pashtoons for such lies and deceived me although being from his place. You can try him for fun with a simple case and see how many types of oiling he suggest in his special service as per his standards. I am on my prayer matt at this night and couldn't stop myself posting this to at least save others. Bottom line, DON'T GET ROBBED AT PAKISTAN AC RAWALPINDI...Fi aman Allah. how about your experience of Linde gas? There is a guy named Abu bakr near sirya chowk G8. He is very humble person . Highly recommended . Ask him for pakwheel discount. Universal AC. Abu Bakr. G-8 sarya chowk islamabad. I can say he is very honest in his work and charges reasonable. Abu bakar is best (G8 03009192687). Do not try to even try murshad car AC, big chor of Islamabad. There is whole story what he did to me. 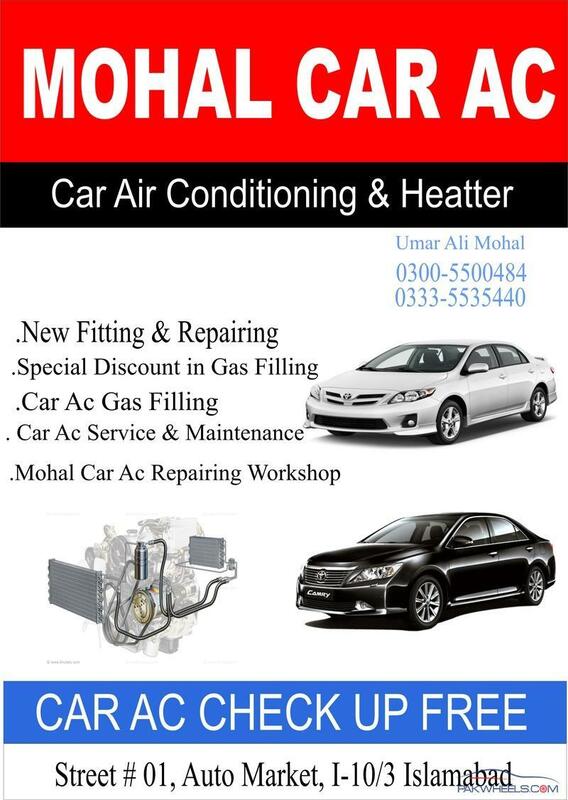 Abu bakar charged me only 3500 for full service, gas charging and correcting problems due to Murshad car AC (G10 I&T Center) while Murshad asked me 5500 and gave me discount of 1000 due to reference.